As a parent, one cannot share all the enthusiasms of one's offspring. For a start, there are too many and they change too often. You master the Wiggles and they're all about Dora. You gain a working knowledge of iCarly and they only want to talk about The Wizards of Waverly Place. Many are simply unwatchable (I'm looking at you, Clone Wars). Many are worth absorbing more for what their appeal says about your child than for themselves. 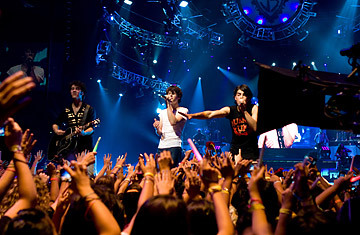 Which brings us to the Jonas Brothers. You get a sense that admiring them will neither pollute nor elevate anyone, so they seem to belong squarely in the harmless-but-not-worth-encouraging column. They aren't going to help you have an interesting conversation with your child, nor do you have to monitor them for inappropriateness. To test this theory, we put their new movie, Jonas Brothers: The 3D Concert Experience, through its paces, asking for reviews from parent (me), target audience (tweens Spike, 11 and his sister Ginger, 8) and veteran movie critic (Richard Corliss). The brothers Jonas, in case you've missed them, comprise Joe, the junior Mick Jagger of the group; Kevin, guitarist and second-string show pony; and Nick, the cute, sensitive, cleaned-up Kurt Cobainy one. You discover this slowly, through the songs, since there's little dialogue in the movie, and most of it in the first 10 minutes after they get their 4:30 am wake up call from bouncer Big Rob and discuss the day's punishing schedule over breakfast. After that it's a parade of songs and screaming fans and one or two cool 3D effects. In other words, pretty dreary. Wear a watch, so you'll have something else to look at occasionally and can gauge the length of your nap. The trailers before the movie, for Ice Age and Up and Monsters vs. Aliens were all also in 3D. After they're done, the entertainment factor drops precipitously. At least it did for me. But what about the movie's real demo? Here, with some parental guidance, is what the young 'uns saw. Not surprisingly, there's a gender divide. Ginger: What was your favorite bit of the movie? Spike: I didn't have one. There were too many things happening all the time: fireworks, and them going up on poles in the air. They didn't need all that. They should have more movie bits and less concert bits. G: Who is your favorite Jonas Brother? S: None of them. Maybe Nick. I don't think Joe even knows how to play guitar. G: but if I had to pick one it would be Joe. He's handsome and he can sing and do tricks. S: No he can't. What tricks did he do? G: He stood back to back with his brother and he did some jumps. And he can play tambourine. S: Anyone can play tambourine. You just shake it. And how would the audience even be able to hear it? G: I think Joe seems to be a bit obsessed with girls. He met those ladies in the car and his brothers had to get him. S: It looked like he was trying to peek up Taylor Swift's skirt on stage. G: On the way to the movie I was looking forward to screaming, but I never screamed. You need more people around you to scream. S: What I didn't get was why the brothers don't ever have a war against each other. There are two that have curly hair. The same two play guitar. Don't they try to kick each other out of the band? G: No, because then Joe would only have a curly-haired brother playing guitar on one side of him on stage. Now he's got one on each side. It's more unique. Mom: Who would enjoy this movie? S: Only Jonas Bros. fans. I'm not really into the Jonas Brothers. Maybe they have some good songs. And it's pretty cool that a teenager can write songs, I guess. G: I don't get how they go to school. They must go to a private school. I don't think they'd last a day at school because the girls would all be "Oh my God!" S: I don't get why the girls are running after them. Just to touch them? That's weird. Read TIME's feature: "The Jonas Brothers Grow Up"